Did you know that butterflies were once believed to be evil? They were even called "Summer Birds." Back in the middle ages, people believed that butterflies and other insects were born from mud by a process called "spontaneous generation." Summer Birds, The Butterflies of Maria Merian by Margarita Engle, focuses on a certain period of Maria Merian's life. At the age of 13, Maria was able to disprove the theory that butterflies were made from spontaneous generation and went through developmental stages of the life cycle. 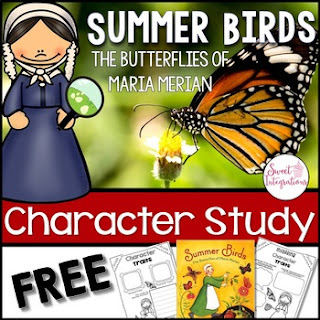 Through this spring mentor text, students dig deep into the character traits of Maria. I've provided printables and Google Slides in this study. Teachers, you will be prompted to make a copy for your students when you click on "Google Drive" when you download the unit. I highly recommend reading this book before any life cycle unit that you may teach. Click HERE to subscribe to my newsletter to receive special offers, giveaways and new products. TpT credits are points, which can be applied to future purchases which will save you money. For every dollar you spend on TpT, you'll earn 1 credit. After you make a purchase, rate and comment fairly on the product page of your purchased item. You need to do both to earn your credits. I value your feedback so I can create quality products for your classroom. You will now receive email updates about my store. Drop by my blog, Sweet Integrations for more ideas for your classroom!